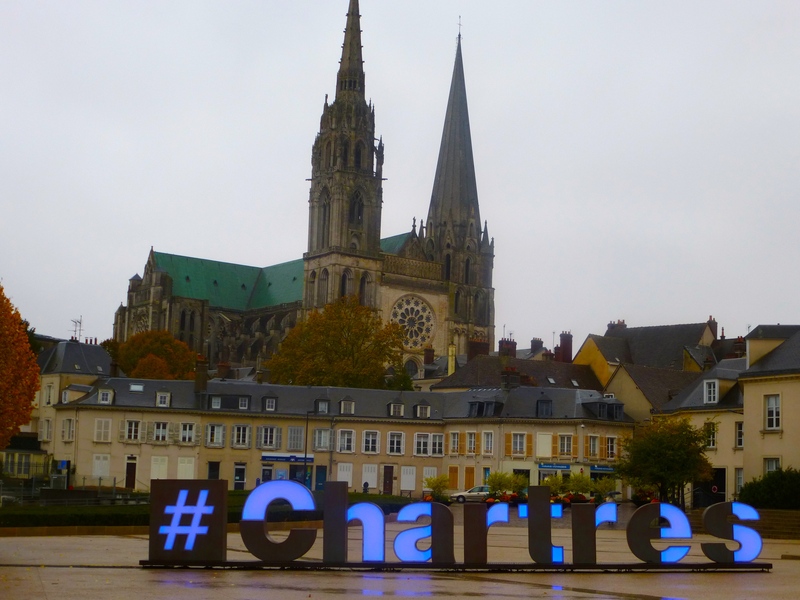 This November 11 was a rainy day to visit Chartres, which meant that the great stained-glass windows of the cathedral wouldn’t be shining in their full glory. Still, there are umbrellas, and so we visited the church and sat through a special Armistice-Day mass (well, most of it—until the priest started blathering on). The singing was especially pleasing in the acoustically-enhancing interior, even though they were singing about Jesus and stuff. 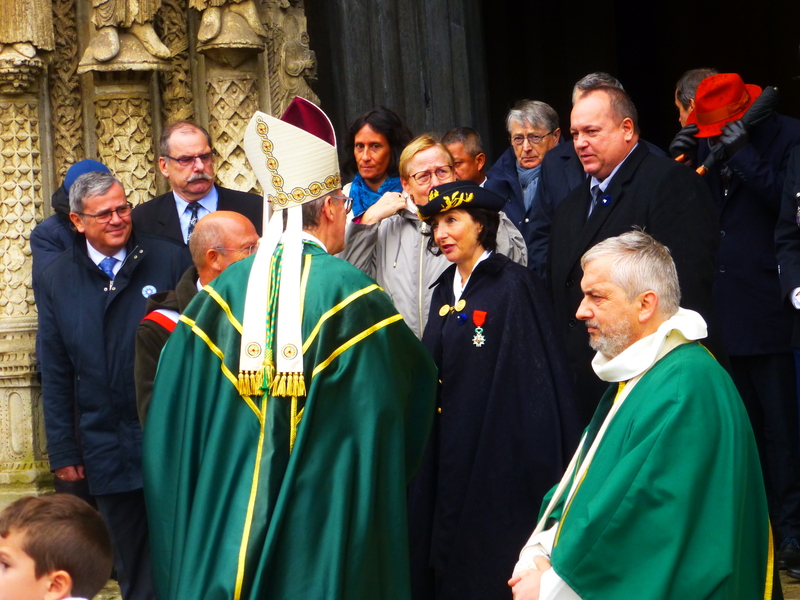 And the priests walked in accompanied by French flags and old military men in their uniforms. 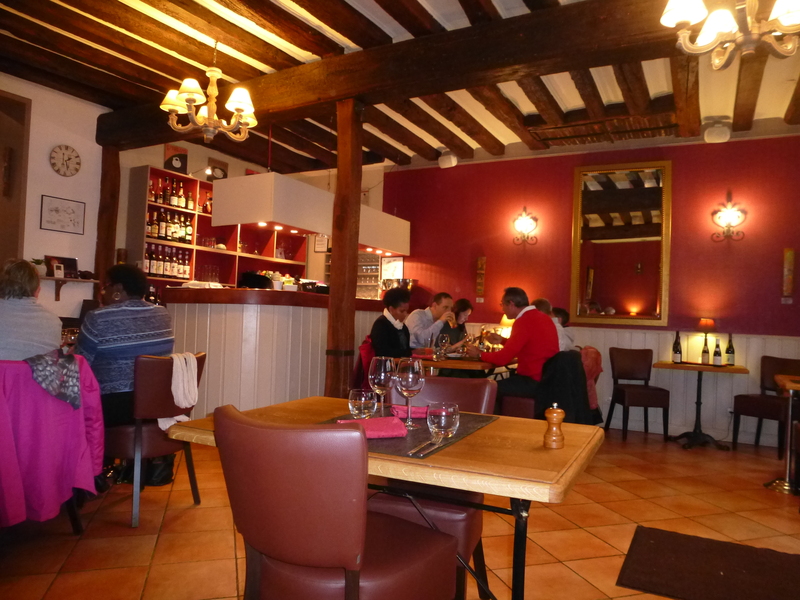 After mass (I never thought I’d write that) and a walk through the medieval part of town (Chartres is a lovely place), it was time for lunch at Esprit Gourmand, a highly-rated restaurant. I’d never been there before, and while lunch was good, I don’t think I’d go back. Service is interminably slow (lunch was about three hours, and we almost missed the train back to Paris), and the food, while very good by American standards, was so-so by my French standards. 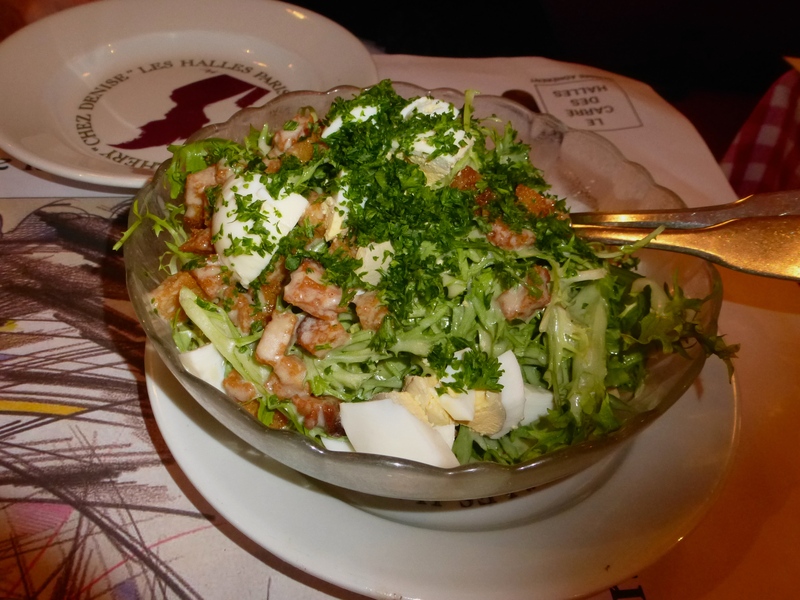 Déjeuner. 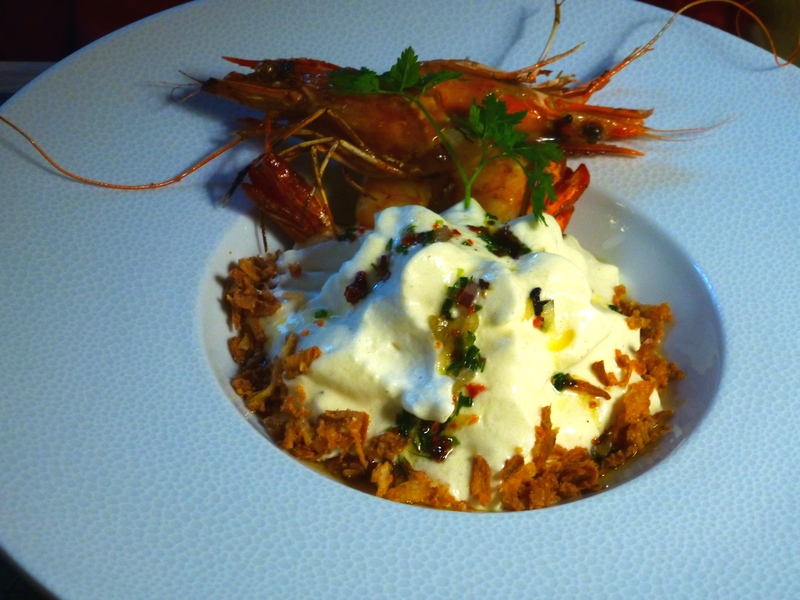 Entrées were roasted shrimp with some kind of savory whipped cream with toasted onions, and foie gras again (I eat a lot of it in France). 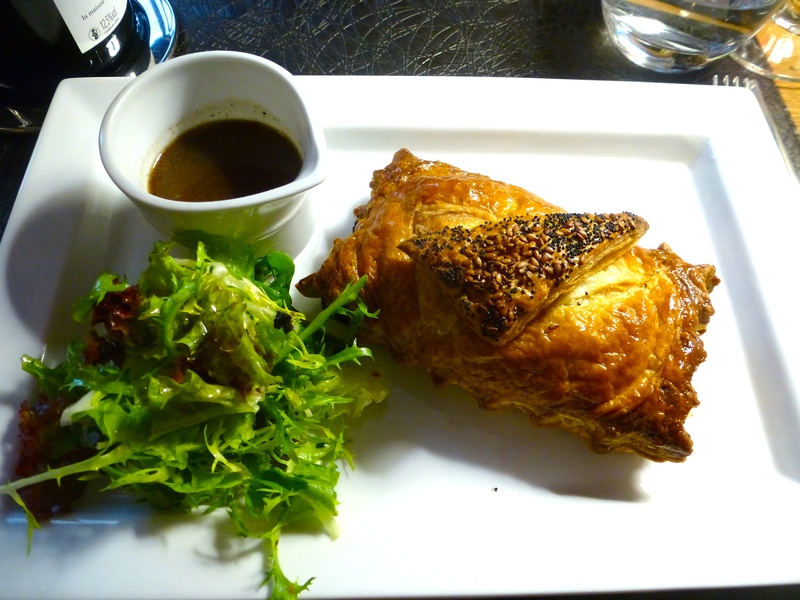 Main courses: Angus beefsteak with salad and a potato cake, and rabbit en croute, which was very good. For dessert I had one boule of each of the five flavors of sorbet, and then there was the best dish of the meal, the “Sphère au Chocolat”, which consisted of a chocolate-covered ball of coconut pastry enclosing a creme filling, over which more warm bittersweet chocolate was poured at the table. 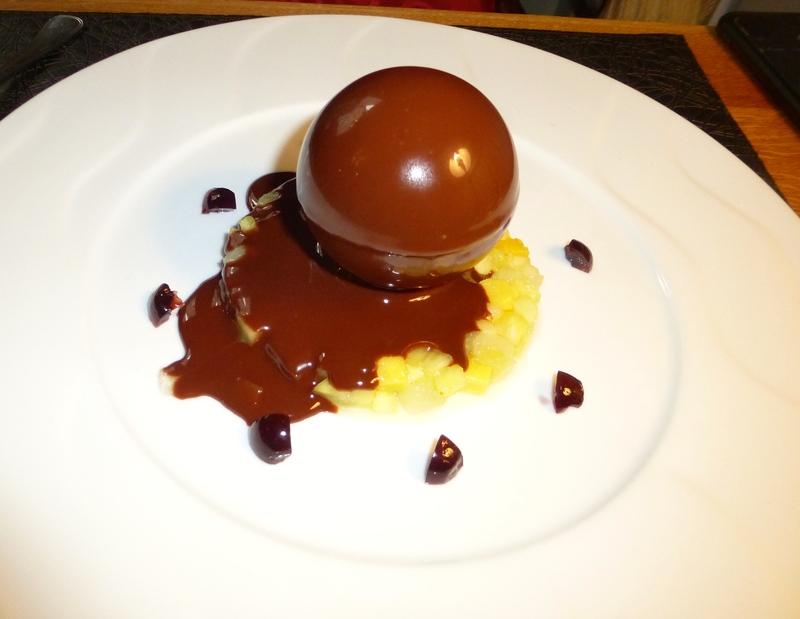 The “Sphére” plate was also covered with diced mangos and pineapple, which went well with the bittersweet chocolate. 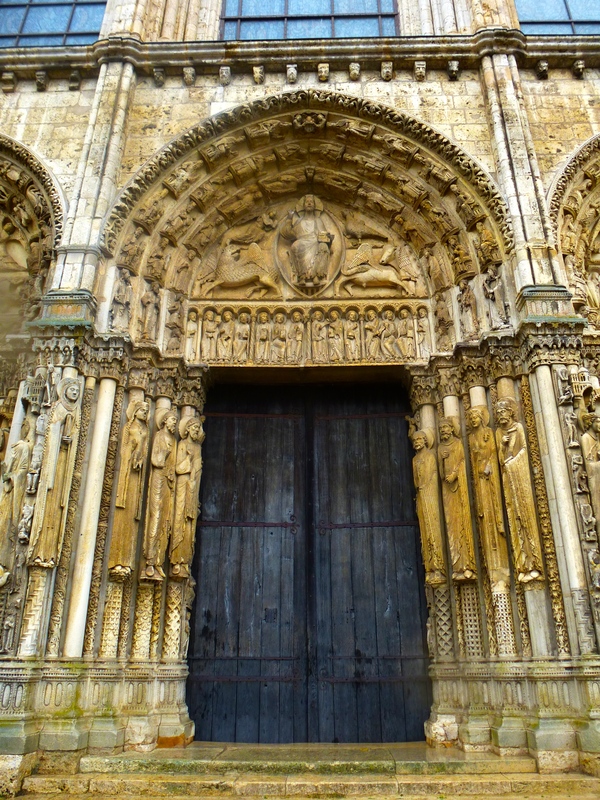 Other things to see in Chartres. The cathedral looms over the town. One can only imagine what impression it gave to twelfth-century pilgrims visiting this magnificent edifice. 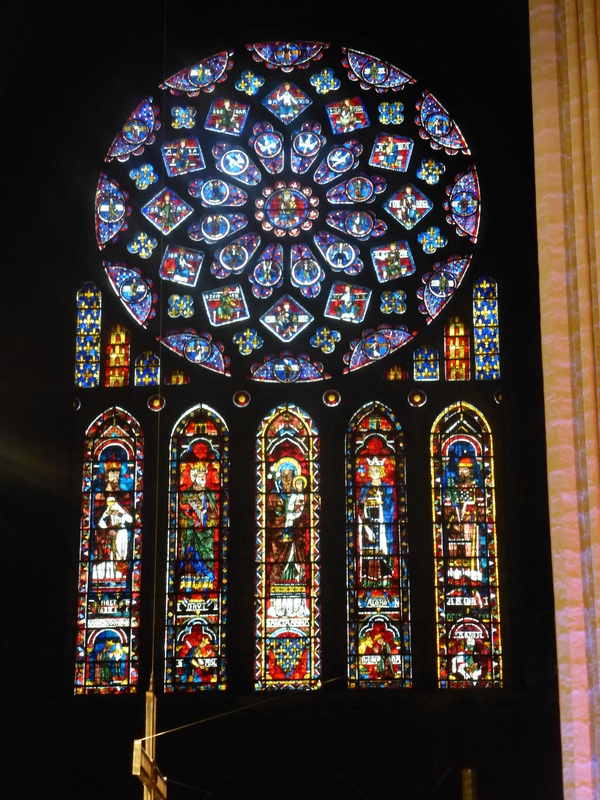 It’s the best-preserved Gothic cathedral in France, and took only thirty years to build. 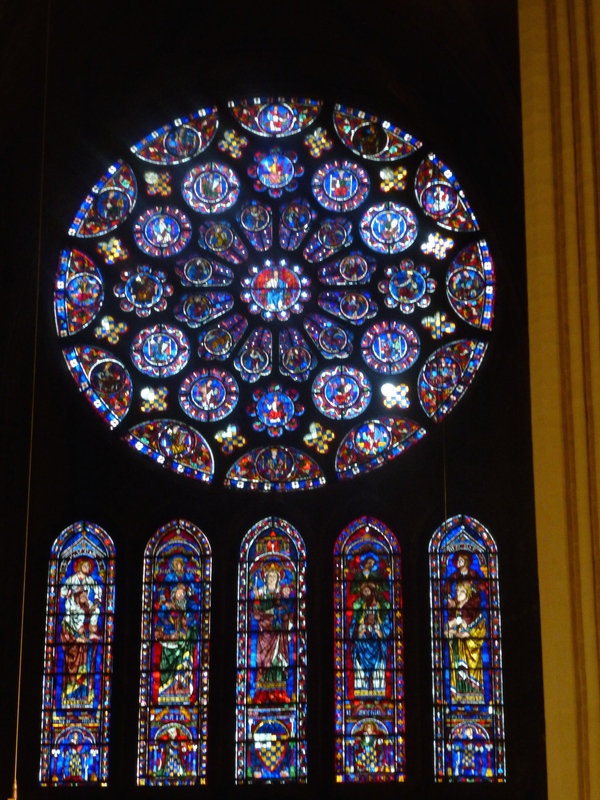 Most of the windows at Chartres are original: 800 years old! The last lunch, as always, was at Chez Denise. 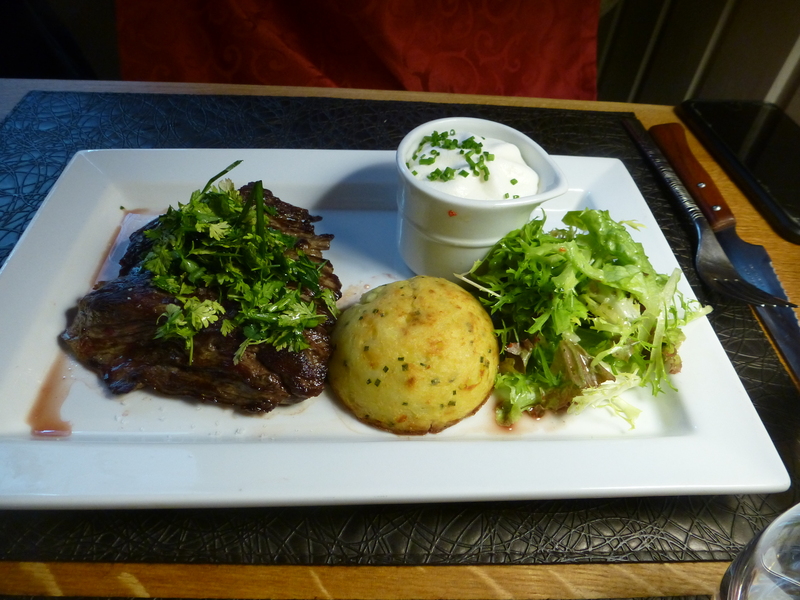 Salade frisée (again), onglet de boeuf (hanger steak, again, cooked rare), stuffed cabbage, and no dessert (dessert was subsequently obtained in a fancy patisserie). And so farewell to Paris again, but I will be back. What a lovely town, to my mind the most beautiful in the world! 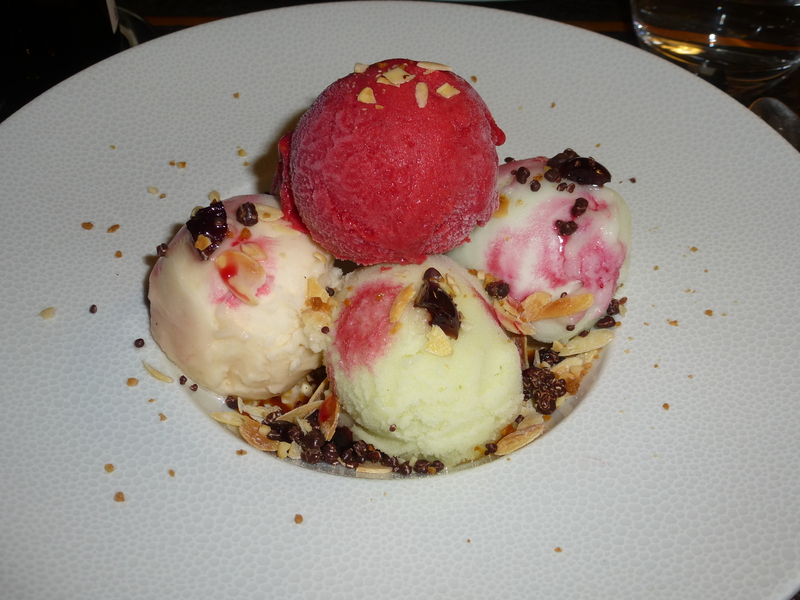 This entry was written by whyevolutionistrue and posted on November 13, 2018 at 12:00 pm and filed under food, food and drink, travel. Bookmark the permalink. Follow any comments here with the RSS feed for this post. Both comments and trackbacks are currently closed. I’m sitting here waiting to go to lunch and drooling over this post and the pictures…. I’ll get out my umbrella. 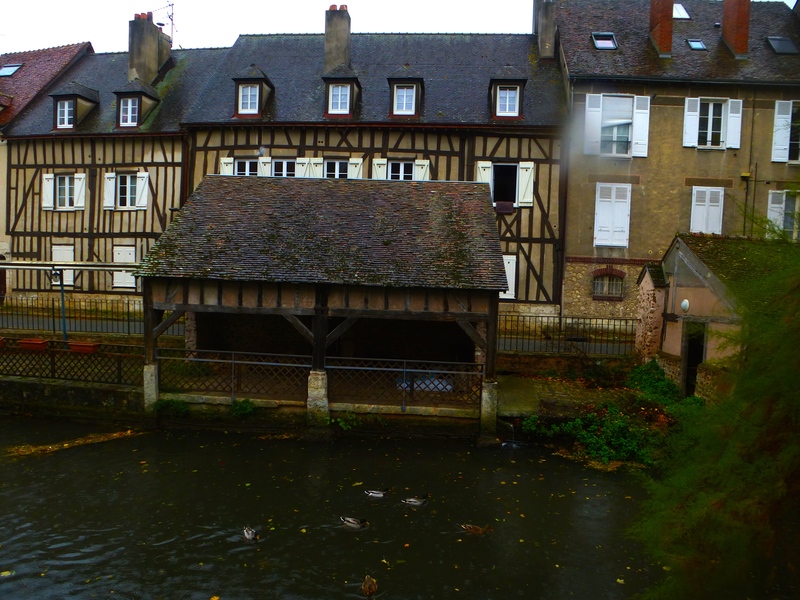 Re “mallards are to be seen in nearly every body of water in Paris” Of course, weren’t you eating them? They do not appear on luncheon plates by magic, you know. Would you like to say explicitly what you’re hinting at here? I guess you missed the note where I asked readers to lay off criticizing my taste in food. Delusion, obsession, and other forms of folie have been responsible for much — perhaps most — art (broadly construed), and religion probably more than any other, at least when it comes to music and painting and sculpture, and some great pieces of architecture and literature, too. The creative and the delusional (especially when it comes to quests for the divine) often exist in close proximity. I’m absolutely certain you have eaten better than many kings, at least the ones from the past. The “Sphère au Chocolat” sounds marvelous. Have a pleasant return trip. The stained glass at Chartres is astonishing, though possibly rivalled by the less well known cathedral of Leon, in Spain. What a shame that mankind’s incredible abilities of expression through art can be so meaninglessly directed. The stained glass capital of France, and probably of Europe, is Troyes in the Champagne-Ardennes region. The city has the highest density of churches with stained glasses and those in its cathedral are on par with those of Chartres. 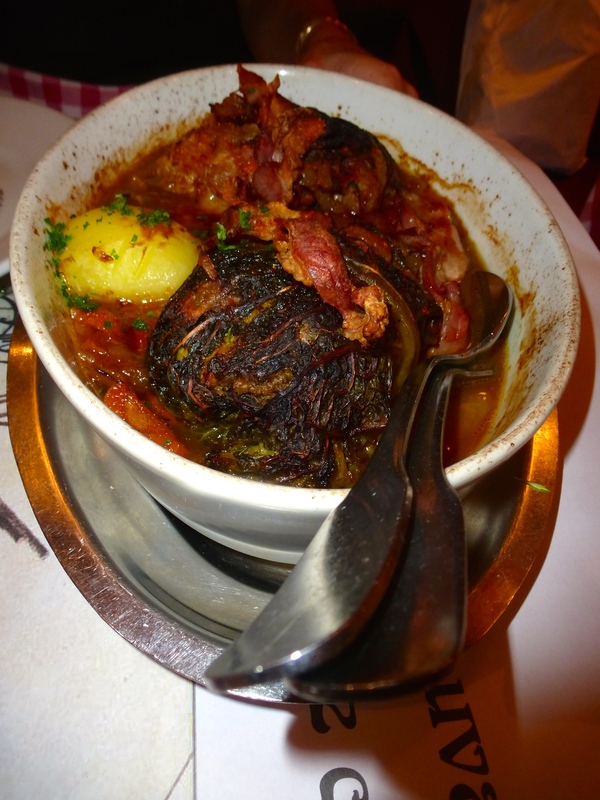 Troyes is also famous (or infamous) for its andouillette AAAAA, a sausage made from pork intestine and stomach, with a flavour that calls to mind the large intestine’s contents. I don’t think there was anything about the Paris trip pertaining to attending conferences or giving talks! “After mass (I never thought I’d write that..” And I never thought I’d read that from PCC(E). If I ate 1/3 of that meal (or any of your Parisian meals), I’d have to call for a wheel chair and an attendant and be wheeled out of the restaurant. This perceptive essay on Anthony Bourdain https://lareviewofbooks.org/article/pouring-one-anthony-bourdain, was published just yesterday in the LA Review of Books. Gives a tangible sense of the origin of the idiomatic phrase about having one’s cake and eating it, too. I adore you Jerry. I have all of your books. I agree with you on almost everything. However, I don’t understand your eating of foie gras. How do you justify it?, especially when you love birds so much? I guess I shouldn’t eat chicken, either, right? And shouldn’t you be criticizing my eating of meat in general? And if you do that, why don’t you go ahead and criticize EVERYONE on this website who eats meat? I’ve made my peace with being an omnivore. I do try to eat animals that have been humanely treated. Foie gras gets a lot of guff from non-omnivores and perhaps some ducks and geese raised for foie gras are mistreated. But I didn’t see any of that when I was in Provence. The ducks (in this case, regular white farm ducks, not mallards) congregated by the gate to be fed a grain mixture (via a funnel) that ultimately caused them to have a fatty liver that becomes foie gras. The ducks were clearly not ‘force bed’ and had a large area and pond in which to wander. Eating animals and appreciating them (and working for their conservation) are not mutually exclusive. 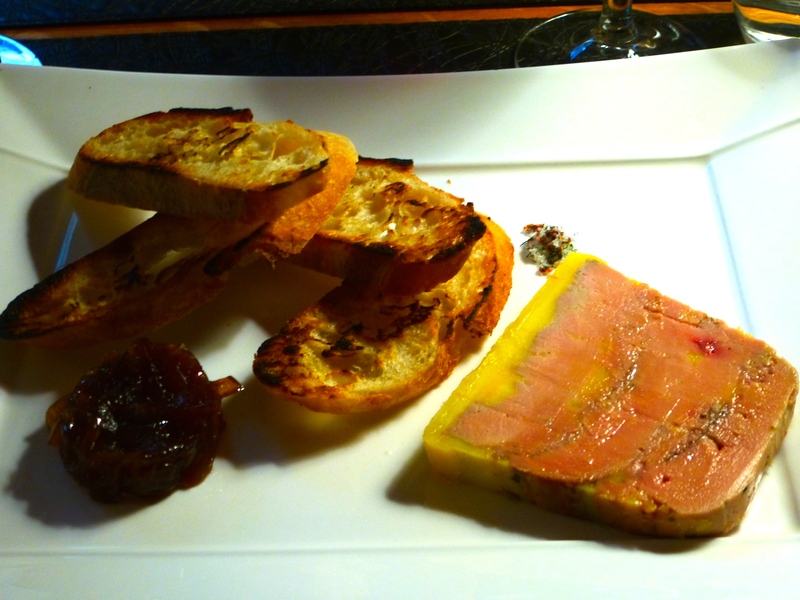 I had foie gras frequently the last time I was in France (it’s heavenly and a lot cheaper than in the states!) and also went birding several times. I Switzerland we have a sharp cultural divide between German and French speaking areas regarding foie gras. 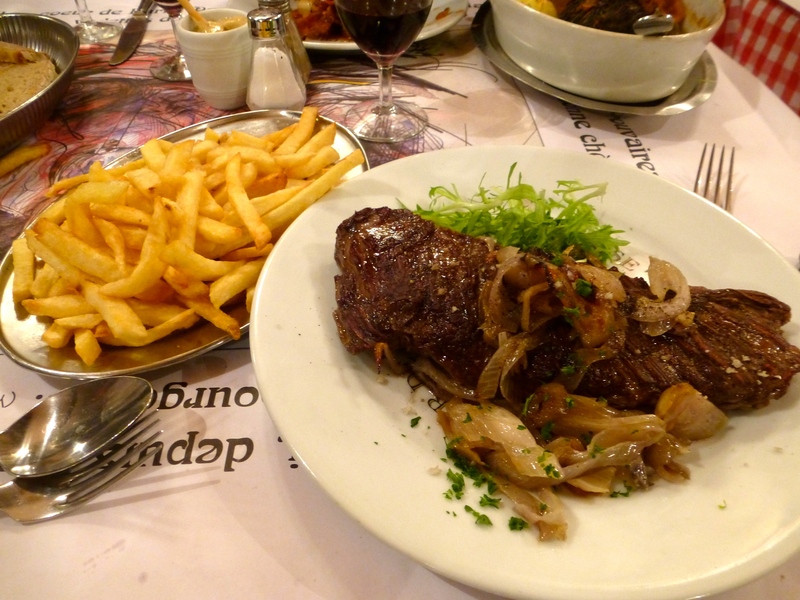 In the francophone areas it is appreciated, you can buy it almost anywhere and is commonly found in restaurants, whereas in the germanophone areas you are considered a sort of protocriminal if you eat it and of course it is not sold. Those Pecksniffs who are so critical about foie gras, but say not a word about factory farming, haven’t done their research. In general, the latter is far more cruel. While I can certainly appreciate the artistry and the architecture of European cathedrals, I’ll take skinks and opossums over saints and apostles any day. There’s only so much stone and concrete I can take before I need to be reinvigorated by botany and biology. Why do we have to choose? I love all those things though artistry and architecture, not saints and apostles. You’re more than welcome to have both, what I meant is only that I am by nature a “country mouse” and the city is a stressful environment for me. I hasten to say that I don’t at all mean to pooh-pooh those whose tastes are opposite mine. In fact I greatly appreciate posts such as these of Jerry’s travels–it’s just the way I want to experience the culture, architecture, cuisine, etc., of the world. I appreciate it most at one remove. Was that a sly dig at you know who? 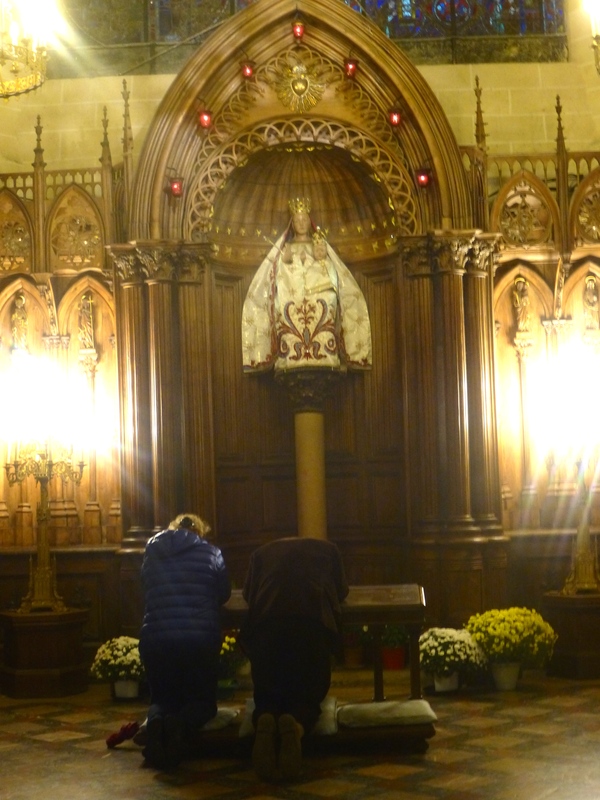 I cannot stay in Paris (which I do at least twice a year) without making a trip to Chartres. As thoroughly secular and a non-believer as I am, to enter the cathedral and the town of Chartres is to capture the echo of the wonder and amazement of the medieval laborers who built it. Having been to many of the cathedral towns in France, absolutely none of them compare to Chartres. Your commentary on the food adds even more delight to my memories of France, and gives me destinations to eat at when I next return. Thanks Jerry! I visited Chartres back in 2000, as part of a tour group. What I recall is that even from some miles away, one can see the church, as it sits on top of a hill. As well, my first thought was of how awed a medieval person must have been to see such a site, in comparison to their ordinary drab lives. 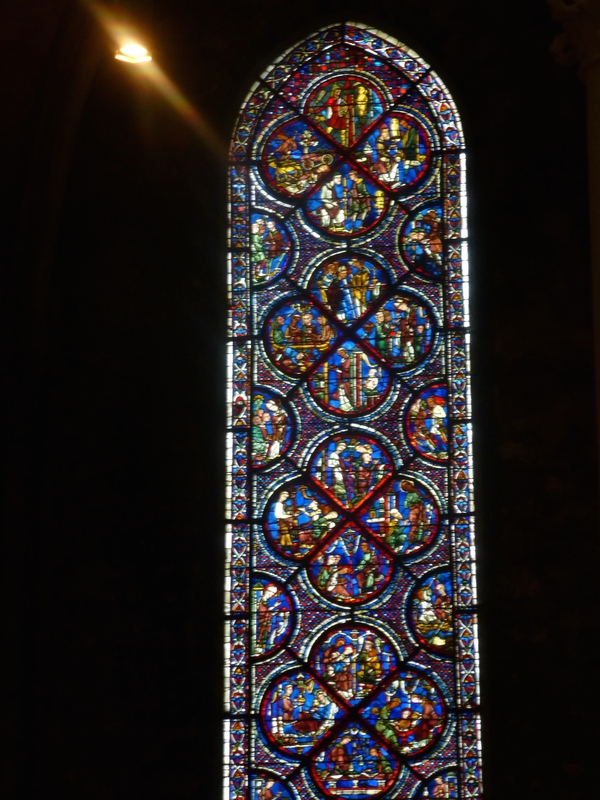 When I visited, there was a British man who was an unofficial guide who interpreted the stories depicted in the windows. He was quite eloquent and knowledgeable. There was also a good sized gift shop at the cathedral, from which I naturally bought a book on the windows. I must say, I felt the visit to the cathedral was still more awe-inspiring than the visits we had to various French castles, including to Versailles (a veritable madhouse). So glad the cathedral has not ever been destroyed in a war. But foie gras means fat liver. It does not mean gavage. Sorry, but that steak is NOT COOKED. 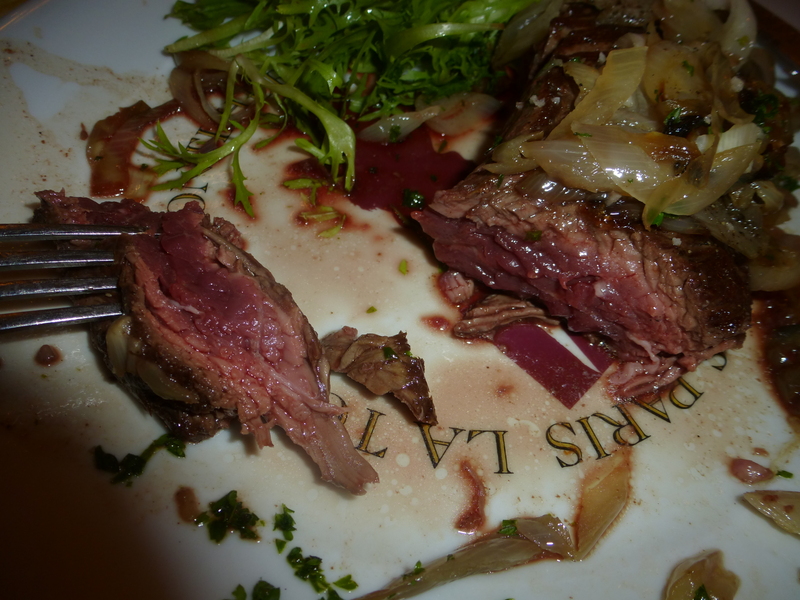 Sorry, but it’s cooked the way many French and I like it. There’s an even rarer classification, called “bleu” (blue). Did you read the post about not criticizing what I eat while on trips? If I want to eat raw meat I’ll wait until I’m stalled in a winter storm on a wagon train in the Sierras. And then only if the first course is my in-laws. Why am I wasting my breath. Nobody’s reading this. That’s ambiguous. What time did you get back? That steak is prepared to perfection. Stick to burgers, you philistine! In the photo of the statues of the saints and apostles, why are the smaller figures along the outer edge of the arch missing their heads? I apologize for not being more specific about the location, but I am glad you noticed them too. Re: Eating better than kings . . . made me recall the great Howlin’ Wolf “Goin’ Down Slow”. Great googly moogly! And they don’t even know about it and good times? I haven’t been in Paris for a long time, but if I could recommend a French Gothic church, with a strong emphasis on authentic medieval GOTH, in France, there is the Strasbourg cathedral, a real gem of the city. To borrow from another place, “if you seek a monument, look around”. And I was talking about that salad! Yowza!